Hurrah for Brandini Toffee- something yummy for all! 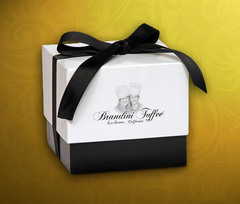 Our first holiday gift rave for 2008 is Brandini Toffee! We love it – and turns out it’s a real big hit – winning awards left and right. We give it FIRST PLACE for tasty delight to share, ship and show off! Secret Recipe: Brandini Toffee is handmade with only four ingredients: butter, sugar, dark chocolate, and roasted almonds. If you love almond toffee – you have to try this. Sold in just a few retailers sprinkled thoughout California – it might be best to order online! Started in 2007 by two high school friends Brandon and Leah to help fund a freshmen trip to Italy (selling candy works girls!) its now a full blown company selling worldwide. We love the inspiration! Tango Diva member Sharon Eucce brought Brandini to our attention – she nuts about packaging and makes the Brandini packaging look great! A lux packaging expert – we count on Sharon to clue us in on latest on the market! Just found out that Brandini will also be on Oprah.com beginning November 11 for her Holiday Gift Guide! Yum is right! !